Few filmmakers capture the beauty and heartbreak of unrequited love like Wong Kar-wai. His innovative, emotionally charged films feature themes of longing, love, loneliness, and the nature of time and memory. These themes figure prominently in one of his best films, In the Mood for Love. Set in 1962 Hong Kong, the film opens with new tenants moving into a crowded and lively apartment building. Chow Mo-wan (Tony Leung) is a journalist and Su Li-zhen (Maggie Cheung) is a secretary at a shipping company. Both are married, but they are frequently left alone since their spouses work late or travel for business. Aside from their introduction when they moved into the building, their initial encounters are polite but fleeting. While Chow and Su seem to have happy and stable marriages, they secretly suspect their spouses of infidelity. Eventually, Chow and Su determine that their spouses are having an affair with each other. Hurt and saddened by this discovery, they meet to discuss the affair. What begins as a clandestine meeting between betrayed spouses soon blossoms into friendship as Chow and Su discover a mutual love of martial arts serials. They begin collaborating on stories, but their friendship becomes the subject of gossip among their neighbors. Chow and Su do not want to be like their cheating spouses, so they keep their friendship strictly platonic; however, as time passes they slowly begin to realize their feelings run far deeper than friendship. A lot of the action takes place off-screen, which shifts the narrative focus to the main characters’ reactions to the affair. Chow and Su’s spouses are only heard in a few brief scenes and have no scenes together, leaving Chow and Su to reconstruct the affair from a few scattered clues and how they imagined their spouses initiated the affair. These scenes are especially well-acted by Tony Leung and Maggie Cheung, whose performances capture the repressed longing under their characters’ desire to maintain propriety. Chow and Su rarely touch and maintain a discreet distance when they’re in public, but their connection is intensely romantic. The film is visually stunning with a soundtrack that complements the movie’s themes and the relationship between Chow and Su. The colors pop with intensity, from the deep red of a curtain blowing in an empty room to the blues and greens of Su’s elegant cheongsams. The memorable soundtrack features classic songs from Nat King Cole and contributions from composers Michael Galasso and Shigeru Umebayashi. Elegantly structured and beautifully filmed, In the Mood for Love is an emotionally resonant story of two lonely people discovering an unexpected connection. 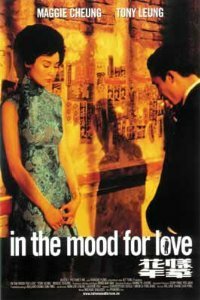 In the Mood for Love is in Cantonese and Shanghainese with English subtitles. A man discovers there’s more to his girlfriend than meets the eye in The Bridesmaid, Claude Chabrol’s adaptation of Ruth Rendell’s 1989 psychological thriller. Philippe Tardieu (Benoît Magimel) lives in a small French city with his mother, Christine (Aurore Clément), and younger sisters, Sophie (Solène Bouton) and Patricia (Anna Mihalcea). He’s begun a promising career as a contractor and frequently offers support and advice to his family. As the film opens, the family is in a period of transition: Sophie is engaged and Christine is dating Gérard Courtois (Bernard Le Coq), a recently divorced businessman. Eager to make a good impression, Christine invites her children to dinner at Gérard’s home and gives him an unusual present from the family’s garden – a bust of the Roman goddess Flora. The dinner goes well, but Gérard abruptly moves away, leaving behind the statue and a heartbroken Christine. Shortly after Gérard’s departure, Philippe, who never wanted to part with the statue, returns to his house to retrieve Flora. At Sophie’s wedding, Philippe meets bridesmaid Stéphanie “Senta” Bellange (Laura Smet). Although they exchange little more than pleasantries during the ceremony, Senta follows Philippe home, where she declares her love for him and tells him that he’s her destiny. Beguiled by her intensity and her uncanny resemblance to Flora, Philippe begins an intense and passionate affair with the mysterious Senta. In the days that follow, Philippe gets an intriguing, and occasionally unsettling, glimpse into his new girlfriend’s eccentric world. She claims to be a theatrically trained actress who’s worked in film, but Philippe is unable find a single play on her bookshelf. Her family owns an elegant mansion yet she prefers to live in the basement. She lavishes him with love and attention but she’s possessive and has a quick temper. Senta also has a macabre fascination with death; as their relationship deepens, she suggests that they prove their love by killing a stranger. Philippe is initially horrified at the request and believes she would never actually kill someone to prove her love for him. Nevertheless, he brings her a newspaper article about an unsolved murder and tells her he’s the killer, hoping this will satisfy her. When Senta follows with a detailed account of a murder she’s committed, Philippe begins to wonder if his girlfriend is simply acting out a morbid fantasy or if she’s really a killer. In The Bridesmaid, Phillipe and Senta’s desires and the compulsions that drive them are key elements of the plot and Chabrol teases them out slowly and methodically. The film moves at a deliberately unhurried pace, with much of the action taking place off-screen. This is a clever way of highlighting the ambiguous nature of Senta and her possible crimes; she’s eccentric and tells Philippe a number of outrageous stories, but is she a cold-blooded killer? The leads are well-cast. Benoît Magimel brings charm and sincerity to the role of Philippe while Laura Smet’s cool intensity hints at the darkness that lies underneath Senta’s declarations of love for Philippe. The Bridesmaid was Chabrol’s second film version of a Rendell novel. In 1995, he released La Cérémonie, a chilling adaptation of her mystery A Judgment in Stone (1977). Although The Bridesmaid is a bit more understated than La Cérémonie, it is an equally effective adaptation of Rendell’s work. The Bridesmaid is in French with English subtitles. Throughout their 30-year history, the band Sonic Youth won critical acclaim for their distinctive dissonant, guitar-driven sound. Led by the husband and wife team of Kim Gordon and Thurston Moore, the band enjoyed commercial success in the early ‘90s with the release of Goo (1990), featuring the single “Kool Thing,” and as a headlining act with the 1995 Lollapalooza festival. Sonic Youth continued to release records and tour until the announcement in 2011 that Kim Gordon and Thurston Moore were divorcing after 27 years of marriage. Fans were shocked. How could a marriage and musical partnership that seemed solid dissolve so suddenly and publicly? Kim Gordon offers thoughtful, well-balanced insight into her career and personal life in her candid memoir, Girl in a Band. Gordon moved to New York in 1980, intending to become part of a thriving art scene that included Cindy Sherman and Jean-Michel Basquiat. I’m more familiar with Kim Gordon’s music than her art, and I especially enjoyed reading her recollections of the New York art world in the late ‘70s and early ‘80s. Gordon was asked to write an article about music, and she chose to focus on the onstage interactions between men. Her article was well-received and inspired her to start making music herself. After meeting Thurston Moore, they formed a band that eventually became Sonic Youth. Their early years were a bit of a struggle as they balanced day jobs with the process of recording, touring, and developing an audience. From the beginning, Sonic Youth had a distinctive musical and artistic aesthetic that carried over into fashion in 1993 when Gordon co-founded the clothing line X-Girl with Daisy Cafritz. Rather than delve into the minutiae of every Sonic Youth song or album, Gordon focuses her discussion of Sonic Youth’s music on songs and albums that are especially meaningful to her. Along the way, she includes fascinating stories and anecdotes about the musicians she toured or worked with, including Public Enemy’s Chuck D and Nirvana’s Kurt Cobain. Told in short, fast-paced chapters, Girl in a Band is an engaging memoir and an entertaining account of an influential period in American alternative music. Check the WRL catalog for Girl in a Band. Meet Barb Colby and Lily Stanton, longtime friends and heroines of Amanda Filipacchi’s sharp and witty fourth novel, The Unfortunate Importance of Beauty. Barb is a costume designer and Lily is an acclaimed pianist. Despite their talents, their lives are defined more by their physical appearance than their accomplishments. In response, Barb and Lily set out to subvert society’s perceptions and expectations of their looks. Wanting to be loved for who she is and not her beauty, Barb uses her design talents to create a fat suit and a wardrobe of dowdy clothing. Whenever she goes to bars or restaurants with her friends, she makes a point of engaging men in conversation then exposing their shallow views on beauty before removing the costume to reveal her true appearance. Her resolve is tested when she meets a man who may be in love with more than her physical beauty. Realizing that her talent may be the only way she can attract Strad, Lily resolves to compose music that’s so alluring he has no choice but to fall in love with her. She starts by composing music that will make people desire objects, such as office supplies or books, and soon develops a lucrative career composing music for companies seeking to increase sales through the suggestive power of music. The piece she composes for Strad brings success; however, complications cause her to reconsider her plan. Barb and Lily are supported in their artistic and personal endeavors by their close friends: Georgia, a successful novelist; Penelope, an aspiring potter who survived a horrific kidnapping; and Jack, a former police officer who rescued Penelope. Collectively, the group is known as the Knights of Creation, and they meet regularly to work on various artistic and literary projects. Gabriel was also a member, and before his suicide he arranged for the group to receive a series of letters. These letters reference Lily’s hopeless crush on Strad and an unsolved murder that was allegedly committed by a member of the group. His final letters warn the group that the killer has planned to murder Strad if Lily doesn’t get over him. The group’s attempt to protect Strad leads to a strange dinner party that serves as his introduction to the Knights of Creation. Filipacchi’s breezy narrative is pitch perfect and never gets too heavy-handed. Barb and Lily’s attempts to transcend their physical appearances result in provocative and often hilarious situations as they struggle to find love and acceptance for who they are, not how they appear. Several intriguing subplots, including one concerning a missing laptop, help flesh out the secondary characters. The Unfortunate Importance of Beauty succeeds as both a quirky mystery and a meditation on beauty itself. Check the WRL catalog for The Unfortunate Importance of Beauty. A young woman has 20 minutes to save her boyfriend in Tom Tykwer’s Run Lola Run (1998), an exciting German thriller that explores themes of time, fate, and love. Lola (Franka Potente) receives a call from her boyfriend, Manni (Moritz Bleibtreu). He’s worried and scared. Lola was supposed to help Manni deliver a bag containing 100,000 Deutsche Marks to Ronnie (Heino Ferch), a mobster; however, she failed to meet him, leaving Manni no choice but to take the subway. During the ride, Manni panics when he sees a police officer. He gets off the subway, leaving behind the bag of money. He has 20 minutes to come up with 100,000 Deutsche Marks or else Ronnie will kill him. Lola tells him not to worry; she will meet him and they’ll figure out a way to get the money. Desperate, Manni tells her that he’s prepared to rob a nearby supermarket if Lola doesn’t show up. Lola urges Manni to wait for her, and then she thinks about possible sources of money. After considering several possible options, she decides to ask her father, a bank manager, for the money. With no time to waste, Lola sprints out of her apartment and spends the next 20 minutes running through the city in a frantic attempt to get the money in enough time to save Manni. Will Lola find 100,000 Deutsche Marks and save Manni’s life? Anything can happen in the course of 20 minutes, and Run Lola Run presents three possible outcomes to this scenario. The same basic sequence of events unfolds with each iteration of Lola’s run, but subtle differences and twists of fate alter the resolution to Lola and Manni’s dilemma. A fast-paced and entertaining exercise in style, Run Lola Run takes a simple and straightforward premise and embellishes it with surreal animation sequences, rapid-fire editing, and a surprisingly tender love story. The movie is only 81 minutes long and Tykwer keeps the story tightly focused; there’s not a wasted scene in the film. Although the scope of the film is limited to Lola’s run, brief interludes between the scenarios establish how deeply Lola and Manni care for each other. In these scenes, they discuss their love and their fears of what might happen should one of them die. As Lola and Manni, Franka Potente and Moritz Bleibtreu bring a wonderful intensity to their roles that makes their characters’ predicament all the more urgent. Run Lola Run is an energetic thriller and a clever meditation on the vagaries of fate. Run Lola Run is in German with English subtitles. Check the WRL catalog for Run Lola Run. Louis Malle’s 1958 crime thriller Elevator to the Gallows opens with a deceptively ordinary telephone conversation. Florence Carala (Jeanne Moreau) and Julien Tavernier (Maurice Ronet) appear to be a pair of lovers innocently planning a passionate rendezvous. Their ardor is palpable and their sentiments are almost poetic. “I won’t leave you, Julien,” Florence tells him, her eyes brimming with tears. “Without your voice, I’d be lost in a sea of silence,” Julien replies. Then the conversation takes an ominous turn. They make plans to meet later that evening at a café once Julien removes the one obstacle standing in the way of their happiness—Florence’s husband and Julien’s boss, Simon Carala (Jean Wall), a wealthy arms dealer. Julien carries out his plan with calm and calculating efficiency. A former Foreign Legion parachutist, he uses his military training to secretly enter Simon’s office. The men have a brief confrontation before Julien shoots Simon, staging the scene to look like a suicide. Julien slips out of the building the same way he entered and conceals the evidence before getting in his car. As he prepares to leave the office, he glances up and discovers he’s left behind a critical piece of evidence. Julien races back into the building to retrieve the incriminating item; however, as he’s riding up in the elevator, a maintenance worker turns the power off, trapping him between floors. Shortly after Julien goes back to the office, his car is spotted by a young couple, Louis (Georges Poujouly) and Véronique (Yori Bertin). Louis has a criminal record, but that doesn’t deter him from stealing Julien’s car, taking Véronique along for the ride. Later that evening, the couple drives past the café where Florence and Julien planned to meet. Florence sees the car speed past the café and believes that Julien has run off with another woman. While Julien struggles to find a way out of the elevator, a despondent Florence wanders the streets of Paris looking for him. Meanwhile, Louis and Véronique continue their crime spree in Julien’s car. They know Julien and his background, and in addition to stealing his car, they check into a hotel under the name Mr. and Mrs. Julien Tavernier. This scheme sets in motion a series of events that could separate Florence and Julien forever. Elevator to the Gallows is a well-constructed thriller that moves at a brisk and tense pace. Instead of relying on surprise plot twists to generate suspense, Malle effectively uses the consequences of the characters’ actions to heighten the tension. It is also a rather stylish and atmospheric film. Henri Decaë’s glorious black and white cinematography and Miles Davis’s distinctive and moody score bathe the action in an air of melancholy. The mood of the film is also reflected in the performances. As the desperate Florence, Jeanne Moreau brings a heartbreaking vulnerability that’s echoed by Maurice Ronet as Julien, her equally besotted lover. Although their phone conversation sets the murder plot in motion, Moreau and Ronet do not share any scenes together; however, they are convincing as a couple willing to do whatever it takes to be together. A classic example of French New Wave Cinema, Elevator to the Gallows is one of Louis Malle’s best films. Elevator to the Gallows is in French with English subtitles. Check the WRL catalog for Elevator to the Gallows.